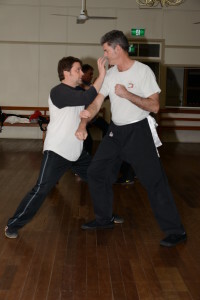 The training of beginners focuses on developing a strong technique (faat ), skill foundations (gung ), relaxation, strengthening and building of correct structure of the techniques and correct motion patterns (from the formless to form). 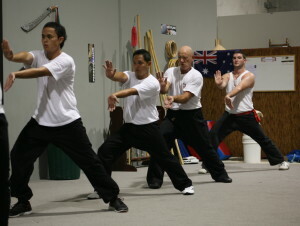 The students first learns specific Gung Fu warming up exercises, basic techniques/drills (saan sik ) and their usage or application (saan sau ) as well as conditioning, strengthening and relaxation exercises (gungfu ). After correct mastery of the basic exercises he/she starts to learn the first empty handed set (kyun tou ), usage of the techniques in a sparring set (deui chaak ) and basic combat sequences and sparring drills (wui hap ). 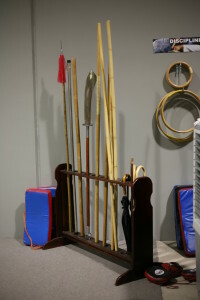 The training of intermediate and advanced students concentrates especially on developing skill (gung ) aspects (“from the form to formless”), sparring sets (deui chaak ), combat sequences and sparring drills and weapon practice (separated techniques, sets, sparring sets, combat sequences and sparring drills and sparring). The emphasis is put on enriching the combat arsenal, combat tactics and strategy, and advance inner aspects of, namely the cultivation of “life energy” (heigung , qigong in mandarin Chinese). The levels of development are listed below with their significant grading forms. This list does not include the hand and leg techniques and their applications specific for each level. Constant attention to the development of the following foundations will occur through out the curriculum.